Journalist Kristin Roberts, executive editor of McClatchy Washington, speaks at Belmont University in Nashville, Tennessee, January 22, 2018. 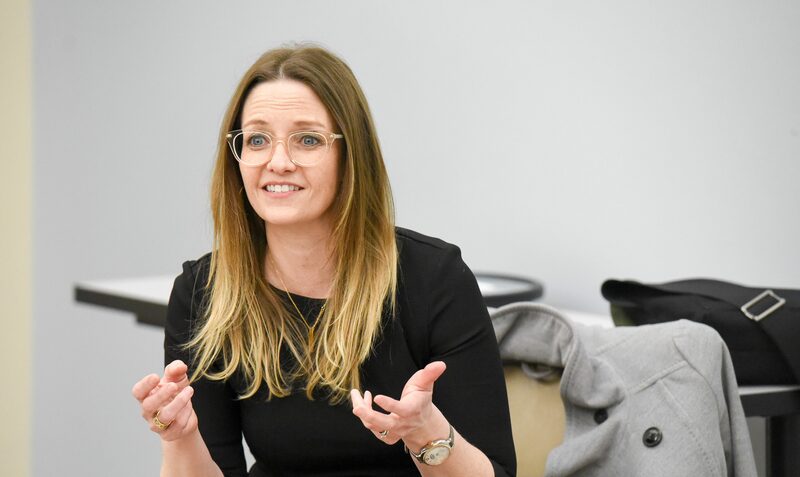 Though a self-described opinionated individual, veteran journalist and McClatchy Washington Executive Editor Kristin Roberts made no bones about her commitment to pursuing objectivity and fairness in reporting while speaking to Belmont students in a variety of classes and gatherings this week. Roberts appeared on campus as a Journalist-in-Residence to give students, particularly those in media studies and political science, an insider’s perspective on their chosen fields. Journalist Kristin Roberts, executive editor of McClatchy Washington, speaks at Belmont University in Nashville, Tennessee, January 23, 2018. During her time on campus, Roberts spent time with Belmont Vision staff and spoke in several media writing and ethics classes. She also led a Q&A with Mass Media and Society students about the influx of fake news while differentiating the phenomenon from media mistakes. Media’s “desperate need to be first” is resulting in reporters only seeking information that already fits their preconceived thesis as well as editors lowering sourcing standards to get a scoop for their outlet. The effect? No one trusts the media anymore, she remarked, pointing to a recent Gallup poll indicating the decline in confidence. Roberts was deeply engaged with the Belmont community throughout the week. In addition to the classes and a Wednesday convo, she also met with administrators in the Office of Communications, Career and Professional Development, Global Studies and Curb College to discuss the overall state of media and potential pipelines for internships. Roberts currently serves as the executive editor of McClatchy Washington, a publishing company that owns 29 daily and 18 community newspapers, including the Miami Herald, the Sacramento Bee, the Lexington Herald-Leader and the (Raleigh) News & Observer. In her former role as national editor of POLITICO, she directed coverage of the 2016 presidential race and helped guide POLITICO’s news approach. She’s also held positions with National Journal and Reuters. Roberts holds master’s degrees from Georgetown University and Columbia University and a bachelor’s degree from The George Washington University.